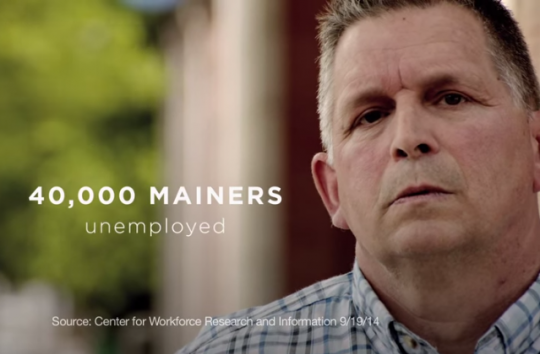 The Democratic Governors Association has again run into trouble with one of the ads it is funding, this time using a picture of a man employed by a company that has praised Maine Republican Governor Paul LePage to represent one of the state's unemployed. The ad comes from Maine Forward PAC, a group funded largely by the DGA, which threw nearly $1 million into the group in September alone. The DGA was one of the founding organizations for the PAC, along with some of Maine's largest labor unions. 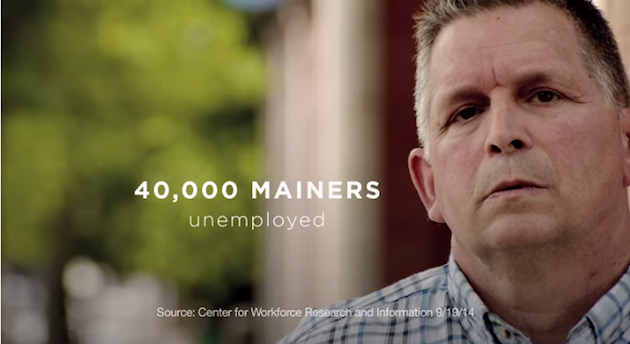 The ad attempts to paint a somber picture of Maine's economic situation, and blames LePage for the state's 40,000 unemployed individuals. But the main image used to represent the unemployed is a man named Roger Gay who is not unemployed at all. Not only does Gay have a job, but his employer, General Dynamics, has praised the economic policies of LePage's administration. The company was featured in Mainebiz as one of the companies that has greatly benefitted from economic initiatives created by LePage. "It's nice to know there are these initiatives going on that are going to address the need to develop the work force," said Chuck Bates, a manager at General Dynamics, referring to a work-force development strategy crafted by LePage designed to address Maine's worker skill gap. "Five years ago those initiatives weren't there," Bates said. "Companies like ours were kind of left to pull together their own method of how they were going to get people into their workplace and train them to be productive." When approached, Gay confirmed that it is his image used in the ad. When asked whether he found the ad to be misleading, he said that he does, according to audio of the conversation provided to the Free Beacon. State Republicans that noticed the flap said they were glad that the Democrats chose to feature somebody that had benefitted from LePage's policies. "The Democrats certainly made an interesting choice when casting their negative attack ad against Gov. LePage," said Maine Republican Party spokesman David Sorensen. "Republicans are happy that Mr. Gay and his employer have benefited from the governor’s economic reforms and we agree with him that Congressman Michaud is beholden to an entrenched party apparatus." This is also not the first time that the DGA has been attached to an ad that badly fails to vet the images it includes in its ads. An attack ad funded by the DGA in Arizona used four stock photos of actors and presented them as victims of Republican Doug Ducey's business career.